Mini cheesecakes made just the way you like them. 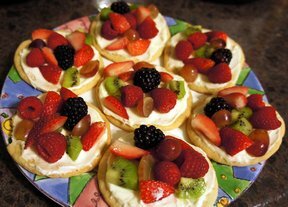 Top them with everyone's favorite fruit for a dessert that your family will love. 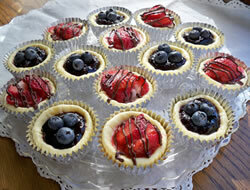 These mini cheesecakes make a pretty dessert to serve on special occasions. 2 packages cream cheese - 8 oz. pkgs. Beat the cream cheese and sugar together in a large mixing bowl until smooth and fluffy. Add the eggs, vanilla, and almond extract; beat until mixed well. Place a cupcake liner in each muffin cup and place a vanilla wafer in the bottom of each one. Fill each cup 2/3 full with the batter. Bake in preheated oven for 25 minutes or until edges are just starting to brown. Leave in the pan and allow the cheesecakes to cool. The centers will fall as they cool. Once completely cooled, refrigerate for at least 4 hours. They can be refrigerated overnight. Garnish with desired fruit. You can garnish with just fruit but they are best if you make a little sauce from the fresh fruit and add about a teaspoon of sauce first; then add the fruit on top. Or make up some lemon curd and place a teaspoon of that on first and then the fruit. SUGGESTED FRUITS: Strawberries, raspberries, blueberries, kiwi, and mandarin oranges. Or you could use blueberry or cherry pie filling for an easy topping. "I have made theys and they are great, the only thing I do different is I use gram cracker on the bottom, super good." "I made these a couple of weeks ago and we really liked them. We are having a cookout for Memorial Day and I thought they would be perfect for that. The only thing I would change is to maybe add two vanilla wafers instead of one. Or I might make up a graham cracker crust and use that in the bottom of each instead of the wafers."